Antioxidants are nutrients that provide protection against health-threatening "free radicals." 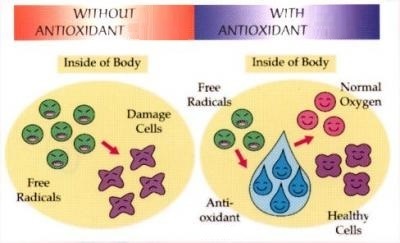 Antioxidants neutralize "free radicals" before they can attack healthy cells and cause damage.It is an antioxidant combination containing Alpha lipoic acid, Green tea extract, Isoflavones, Vitamin C, Coenzyme Q10, Pine bark extract, Lycopene and Mecobalamin. It is well-defined as a therapy for preventing diabetic polyneuropathies, and scavenges free radicals, chelates metals, and restores intracellular glutathione levels which otherwise decline with age. Free radicals, also known simply as radicals, are organic molecules responsible for aging, tissue damage, and possibly some disease. These molecules are very unstable, therefore they look to bond with other molecules , destroying their health and further continuing the damaging process. ●	Antioxidants such as vitamin E and ascorbic acid may help in delaying the process of aging. Alpha-Lipoic Acid (ALA) is a mitochondrial fatty acid; Also known as universal antioxidant; holds the capacity to neutralize the effects of free radicals in both fatty and water-based environment. 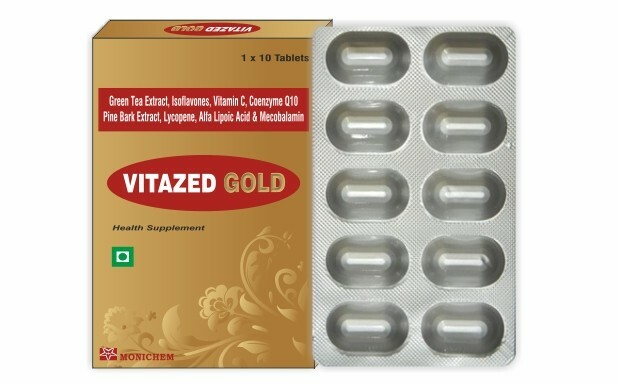 Also helps detoxify the liver of metal pollutants; blocks cataract formation; protects nerve tissues against oxidative stress; reduces blood cholesterol levels; aids in the prevention and treatment of diabetes and cardio-vascular disease. Coenzyme Q10 (CoQ10) is a vitamin-like substance that plays a key role in the metabolic process that supplies all cells with energy. Tissues with a high energy requirement, such as the heart, are particularly dependent on maintaining an adequate supply of CoQ10 for normal functioning. Co-Enzyme Q10 is an essential component of the mitochondria - "the energy producing unit of the body". Deficiency of CoQ10 has been identified as a risk factor for a variety of disorders, including cardiovascular and neurological diseases. Multiple substances in green tea may contribute to its health benefits. Caffeine, theanine, theaflavins, theobromine, theophylline, and phenolic acids are found in green tea. In vitro, animal, and human studies suggest that the polyphenols in green tea are potent antioxidants with antimutagenic, antidiabetic, antibacterial, anti-inflammatory, and hypocholesterolemic properties. It helps protect against cancer by blocking the formation of cancer causing compounds, and suppressing the activation of carcinogens; lowers cholesterol levels and reduces the clotting tendency of the blood; stimulates the immune system; fights tooth decay; helps regulate blood sugar and insulin levels; combats mental fatigue; delays the onset of atherosclerosis; has shown to help asthma sufferers. A major and very potent antioxidant; plays a primary role in the formation of collagen, which is important for the growth and repair of body tissue cells, gums, blood vessels, bones and teeth; protects against the harmful effects of pollution; protects against infection, and enhances the immune system; helps protect against many forms of cancer by counteracting the formation of nitrosamines (cancer-causing substances); protects against abnormal blood clotting and bruising, and may reduce the risk of cataracts; aids in the treatment and prevention of the common cold; prevents scurvy; reduces the effects of many allergy producing substances; helps lower blood pressure; is vital for wound healing; strengthens the blood vessels; reduces cholesterol and protects against heart disease; aids in the production of "anti-stress" hormones; is needed for healthy adrenal function; helps expel heavy metals and other toxic substances from the body. Lycopene; a member of carotenoid family; is a lipid soluble antioxidant synthesized by many plants and microorganisms. Lycopene is a red, fat-soluble pigment classified as a carotenoid, found in many fruits and vegetables. The health benefits of Lycopene are attributed to its potent antioxidant nature. After ingestion, Lycopene is incorporated into lipid micelles in the small intestine. These micelles are formed from dietary fats and bile acids, and help to solubilize the hydrophobic Lycopene and allow it to permeate the intestinal mucosal cells by a passive transport mechanism. It has the ability to quench singlet oxygen, to trap peroxyl radicals, to inhibit the oxidation of DNA, to inhibit lipid peroxidation, and in some studies, to inhibit the oxidation of low-density lipoprotein (LDL). Most potent, natural antioxidant; 50 times more potent than Vitamin E and 20 times more potent than Vitamin C in terms of antioxidant activity. Has been beneficial in attention deficit disorder, allergies, Alzheimer's, atherosclerosis, arthritis, asthma, depression, fibromyalgia, heart disease, hemorrhoids, lupus, macular degeneration, manic depression, ulcers helps prevent the release of histamines and thus reduces allergic symptoms; supports the circulatory system; gives your skin and tissues more elasticity and strength (less wrinkles) by preventing breakdown of collagen; strengthens capillaries, arteries, veins and blood vessel walls. A recent study has demonstrated that isoflavones have potent antioxidant properties, comparable to that of the well known antioxidant vitamin E. The antioxidant powers of isoflavones can reduce the long-term risk of cancer by preventing free radical damage to DNA. ●	Aluminum, Estrogens, Fluphenazine, Statins may interact with vitamin C.
Information regarding safety and efficacy in pregnancy and lactation is lacking. Consult your doctor before taking any medicine during pregnancy & lactation.